A wide variety of sizes and styling, here is our wide selection of journals, Sketch Books and Leather-bound Journals. Each not only offers the high quality of a leather bound book, but also features pages made entirely from recycled fabric and biomass, offering you acid-free content that is also wood pulp free. This Believe Fairy Journal Set comes from designer Amy Brown. Cover and pen made from cold cast resin with hand painted details. Journal measures approximately 5.5 x 8 inches with 45 blank sheets. Pen measures 5.75 inches. This Bewitched Journal features a beautiful cover designed by artist Lisa Parker, depicting a black cat and a magical book. Approximately 80 blank pages, journal measures 5 x 7 inches. This Celtic Butterfly Journal features a beautiful cover designed by Brigid Ashwood. Pages are lined on one side and blank on the reverse, so you may fill it with thoughts and sketches. Elastic closure/place marker. Approximately 200 pages, journal measures 6 x 8.25 inches. This Celtic Horse Journal features a beautiful cover designed by Brigid Ashwood. Pages are lined on one side and blank on the reverse, so you may fill it with thoughts and sketches. Elastic closure/place marker. Approximately 200 pages, journal measures 6 x 8.25 inches. This Blue Butterfly Fairy Journal features a beautiful cover designed by Anne Stokes. Approximately 80 blank, unlined pages, journal measures 5 x 7 inches. This Black Cat Witching Hour Journal features a beautiful cover designed by Lisa Parker. Approximately 80 blank, unlined pages, journal measures 5 x 7 inches. Our Celtic Knot Leather Blank Book is framed in intricate borders depicting foliage and leafwork, the Celtic Knot leather blank book features an elaborate pattern of knot work both upon its front and back covers. This Celtic Raven Journal features a beautiful cover designed by Brigid Ashwood. Pages are lined on one side and blank on the reverse, so you may fill it with thoughts and sketches. Elastic closure/place marker. Approximately 200 pages, journal measures 6 x 8.25 inches. This Celtic Owl Journal features a beautiful cover designed by Brigid Ashwood. Pages are lined on one side and blank on the reverse, so you may fill it with thoughts and sketches. Elastic closure/place marker. Approximately 200 pages, journal measures 6 x 8.25 inches. This Dragon Beauty Journal features a beautiful cover designed by Anne Stokes. Approximately 80 blank, unlined pages, journal measures 5 x 7 inches. This Dark Fairy Journal features a beautiful cover designed by Anne Stokes. Approximately 80 blank, unlined pages, journal measures 5 x 7 inches. This Dragonkin Journal features a beautiful cover designed by artist Anne Stokes. Approximately 80 blank, unlined pages, journal measures 5 x 7 inches. Celtic Leather Journal makes a perfect medieval leather diary. This book comes with an embossed leather binder and antique brass lock. Thick pages are bound together in the traditional method using string. Antique feel, 5in x 7in, 240 pages. Our Celtic Leather Journal makes a perfect medieval leather diary. Crafted from supple, embossed leather; the blank textured pages within are bound to the leather cover. The closure clasp is crafted from brass. Our Medium God's Eye Leather Blank Book is a 5 inches by 7 inches leather-bound blank book that provides for you a powerful tool for your metaphysical studies. Our Large 1842 Poetry Leather Blank Book is bound in beautiful, red hued hand-stitched leather, this fantastic 5.5 inch by 9 inch journal. Our Green Scroll Leather Sketch Book is created in the design of an old scroll or parchment case, meant to endure traveling in saddlebags and other such modes of travel, this Scroll Leather Sketch Book has been exquisitely crafted of flexible leather, allowing it to be bent and folded without damage to the paper within. This Fortune Teller Journal features a beautiful cover designed by Lisa Parker. Approximately 80 blank, unlined pages, journal measures 5 x 7 inches. This Ivy Book of Shadows features a beautiful cover decorated with a pentagram surrounded by ivy and Celtic knotwork. Approximately 80 blank, unlined pages, journal measures 5 x 7 inches. This Miniature Pentagram Spell Book measures a diminutive 4 x 2.75 inches, yet contains 80 blank pages, ready to fill with your own potions, thoughts, and sketches. This Miniature Pentagram Spell Book in Green measures a diminutive 4 x 2.75 inches, yet contains 80 blank pages, ready to fill with your own potions, thoughts, and sketches. This Miniature Book of Shadows measures a diminutive 4 x 2.75 inches, yet contains 80 blank pages, ready to fill with your own potions, thoughts, and sketches. This Magic Fairy Journal Set comes from designer Amy Brown. Cover and pen made from cold cast resin with hand painted details. Journal measures approximately 5.5 x 8 inches with 45 blank sheets. Pen measures 5.75 inches. This Imagine Fairy Journal Set comes from designer Amy Brown. Cover and pen made from cold cast resin with hand painted details. Journal measures approximately 5.5 x 8 inches with 45 blank sheets. Pen measures 5.75 inches. This I Do Believe in Faeries Journal Set comes from designer Amy Brown. Cover and pen made from cold cast resin with hand painted details. Journal measures approximately 5.5 x 8 inches with 45 blank sheets. Pen measures 5.75 inches. This Midnight Messenger Journal features a beautiful cover by artist Anne Stokes showing a snowy owl with an important scroll. Approximately 7 x 5 inches, 160 blank pages. This Mystic Aura Journal features a beautiful cover by artist Anne Stokes depicting a fairy and butterflies. Approximately 7 x 5 inches, 160 blank pages. Leather Bound Leaf Pattern Journal makes a perfect medieval leather diary. Crafted from supple, embossed leather; the blank textured pages within are stitched and bound to the leather cover. The closure clasp is crafted from brass. 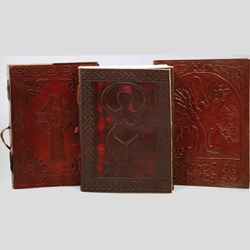 Leather Bound Celtic Cross Pattern Journal makes a perfect medieval leather diary. Crafted from supple, embossed leather; the blank textured pages within are stitched and bound to the leather cover. Closure clasp is from brass. Our Greenman Leather Blank Book features the Greenman, who is a figure known for having been depicted on stonework, buildings, and statues influenced by Celtic design, and has come to be revered as a figure representing the masculine, wild side of nature and rebirth. Our Small Pentagram Leather Blank Book is made of hand tooled leather, the Pentagram leather blank book is a beautiful book for the creation of your new Book of Shadows, dream diary, or any other such magical journal or grimoire that you are putting to pen. Our Southwest Side Stitched Leather Blank Book Large is a fantastic leather blank book, each is slightly different, with its own unique, hand-worked leather binding, elaborate scrollwork engraved into the surface of the cover's leather, and a border of tightly braided leather cord. Our Whale Leather Blank Book is a wonderful book for anyone who adores the sea and its gentle inhabitants, this leather blank book has been skillfully hand-tooled to depict the majestic image of a hunch back whale, breaching the waves on its front cover. This Tree of Life Dream Journal features a beautiful cover designed by Anne Stokes. Approximately 80 blank, unlined pages, journal measures 5 x 7 inches. This Pentagram Spell Book in Red features a beautiful cover designed by Anne Stokes. Approximately 80 blank, unlined pages, journal measures 5 x 7 inches. This Pentagram Spell Book in Purple features a beautiful cover designed by Anne Stokes. Approximately 80 blank, unlined pages, journal measures 5 x 7 inches. This Raven and Talisman Journal features a beautiful cover designed by Anne Stokes. Approximately 80 blank, unlined pages, journal measures 5 x 7 inches. This Once Upon a Time Journal features a beautiful cover designed by artist Anne Stokes, depicting a princess with her dragon. Approximately 80 blank, unlined pages, journal measures 5 x 7 inches. This Quiet Reflection Journal features a beautiful cover by artist Lisa Parker depicting a wolf laying in quiet in reflection under the moon. Approximately 7 x 5 inches, 160 blank pages. This Spirit Guide Journal features a beautiful cover by artist Anne Stokes depicting a winged angel on a serene beach. Approximately 7 x 5 inches, 160 blank pages. The Small Fairy Moon leather blank book features the hand-tooled image of a fairy, sitting within the crescent of the moon as though it were a great swing. 5in x 7in. Antique brass lock. 110 pages. Our Rolled Leather Journal makes a perfect medieval leather diary. This book comes in a leather binder and has a leather strap that wraps and ties the journal to lock your secrets away. Antique feel, 5in x 7in, 96 pages. Rolled Leather Journal in green leather, makes a perfect medieval leather diary. The journal is crafted from supple, leather, but it can be rolled up like a scroll for ease of transport or storage for the the wayward traveler.